MOJO® has come up with the easiest way to transport your MOJO decoy to and from the blind or field with the MOJO® Pack. 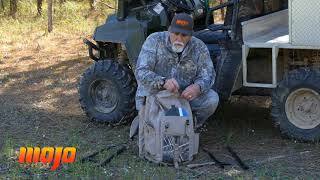 The MOJO® Pack is specifically designed to carry all of your MOJO decoy accessories .....duck, wings, poles, and batteries. This MOJO® Pack has padded straps and back for a comfortable ride on your back to free up hands for other gear. Also, with a zippered closure and a weather flap to keep other valuables in. Every MOJO® owner needs one or more of these.